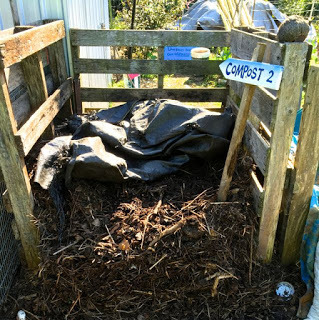 Compost Confusion: A lot is written about composting but many people are still confused and fail at their first attempt and then give up – ‘the heap didn’t break down’, ‘it went really slimy’, ‘it just stank and was full of cockroaches’ etc. AND – it is deeply satisfying. 1. Get the recipe right. 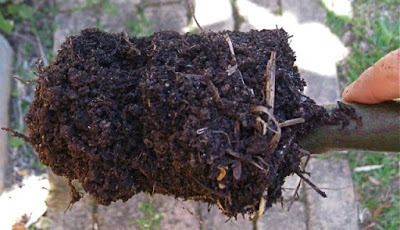 For compost heaps to work they need about 15-20 parts CARBON (C) (dry,brown stuff) to one part NITROGEN (N) (green stuff/manure). That’s a lot of brown stuff to green. To help you – think about how nature feeds itself – say a forest? What is dropping on the forest floor to replenish it? A lot of leaves, decaying logs, branches, strips of bark, ash from spot fires, fallen flowers, fruit, feathers, shed animal skins, egg shells, decaying bodies of animals and insects etc. That’s a lot of brown stuff to green. There is a direct correlation here and it’s helpful in thinking how compost is made in nature and what you should be putting in your heap (just leave the dead bodies out please!). I repeat because it is important – you need 3 times more of the CARBON stuff (sawdust, coffee grounds, dry leaves, straw, newspaper,) than the NITROGEN (fresh pulled weeds, fresh grass clippings, seaweed, fresh manure, stable sweepings, most kitchen scraps etc). TOP TIP: Keep some sawdust, shredded newspaper OR A BALE OF STRAW next to your bin and add a handful every time you put a load of weeds, kitchen scraps or grass clippings – this way you will be getting the recipe just right. BECAUSE MOST PEOPLE HAVE MORE GREEN STUFF THAN BROWN AND THAT IS WHY THEIR COMPOST DOESN’T WORK!! 2. Keep it simple. There is no need to go out and spend $500 on a compost bin. Choose the system that will work for you and your family – one that you will use. 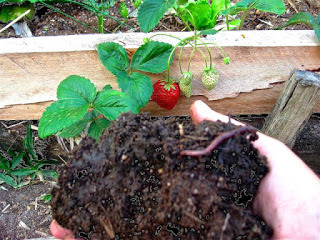 If you don’t have enough stuff to fill a compost bin fairly quickly then you may be better off with a small and compact worm farm. What Kind of Bin: Compost bins need to be large enough to generate adequate heat – about 55oC – to break down materials and prevent unwelcome guests like cockroaches. I have always had success with the plastic black bins – the million dollar bins (they are made from recycled banknotes!). However they will generally not get hot enough to kill off seeds – so don’t put invasive weed seeds in there – feed them to the chooks (or worm farm) or chuck them in a garbage bin full of water for a couple of weeks and let them rot down – this can then be poured onto the garden as an organic slurry (I do this with cobblers pegs, travelling Christian and stuff like Singapore daisy). DON’T THROW IT OUT, RECYCLE IT! If you have a large garden you may opt for a bigger space to make your compost and one of these bays made from recycled wooden pallets is ideal. Note the black plastic ready to cover the heap when it rains – compost heaps like to be moist but not waterlogged. 3. Give me a sunny spot. A lot of people make the mistake of putting their compost bin out of sight/down the back/behind the shed etc. There are two problems with this. 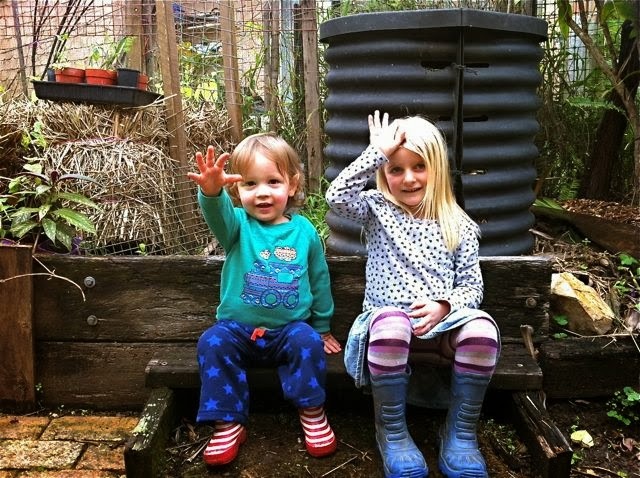 Firstly: for compost heaps to work they need to be warm and airy. Secondly: if it’s not convenient you won’t use it. You won’t be making trips to them with the kitchen scraps if they are too out of the way. Return a little of what you have taken – don’t throw it away. Composting is part of the natural cycle of life – by returning to the soil what once was living you will be part of that valuable process. Compost adds life to the soil. It improves plant growth, increases the capacity of the soil to hold nutrients and water and the ability of plants to resist disease. “If we returned our bodies to the soil, and all of our human and organic waste, we would go a long way to solving the earths’ soil fertility problems. Bill Mollinson (co-founder of the Permaculture Movement) from a lecture I attended in 1988 and have never forgotten It is one of the reasons I do what I do – including trying to get a Natural Burial Ground for our community – nothing organic should be burned or buried deep in the ground – including us. Too many citrus peels – they rapidly change the pH and kill off the micro-organisms necessary to make the compost work. Large pieces of watermelon skin and pumpkin will attract rats – chop it up and bury it in the middle of the bin. 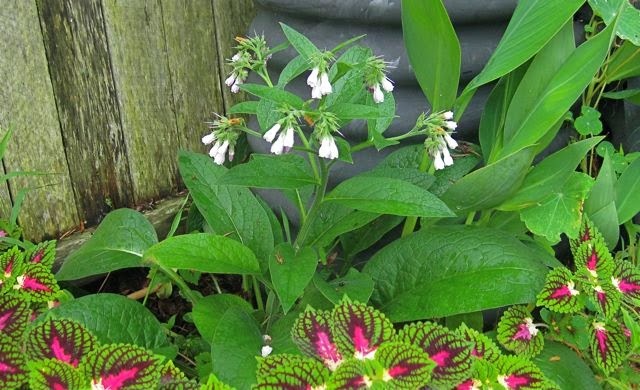 Comfrey growing next to my compost bin – keep it handy! Foul smells – usually means the heap too wet and has become anaerobic – that means it has stopped working because too much green (nitrogen stuff OR not covered during heavy rain). Solution – add some brown (carbon stuff a handful of garden lime/ dolomite or wood ash) and turning the heap will help to combat this. Not working at all – too cold/dry/or not enough N – add some fresh garden weeds/manure/lawn clippings/comfrey and maybe move to a sunnier spot. 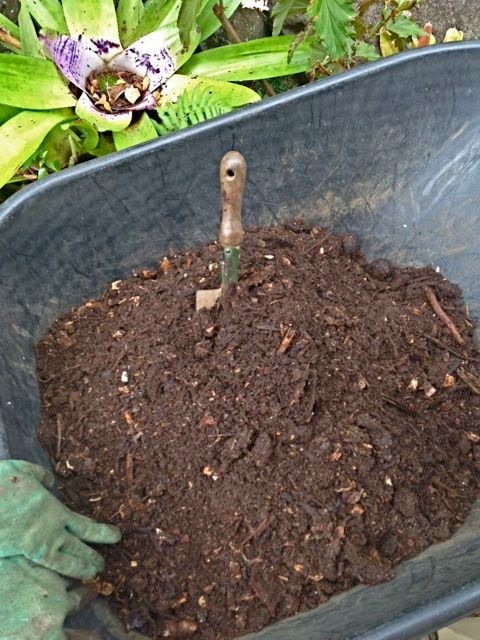 TIP: The smaller the pieces that you put in your compost the quicker it will work. Weed and prune your garden beds before you mow – use the catcher and you will have a perfect shredded mix to add to the compost heap. What a lovely load of rubbish! ♥ Soldier Fly Composting. 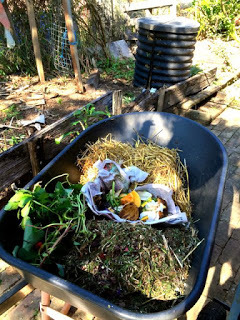 If you have chooks you might want to look at this system of composting because it means that you can just about put anything in your compost, including meat, fish, fats and these critters will gobble it up amazingly quickly – you then feed the grubs, before they hatch, to your chooks/ducks/geese etc. To be continued.